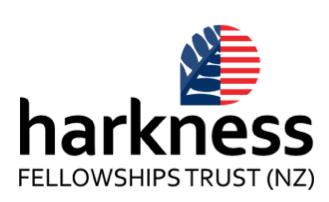 New Zealand Harkness Fellowships are for emerging New Zealand leaders in any field of study or vocation (excluding health care policy and practice) to study or research in the US for a minimum of twelve weeks. One New Zealand Harkness Fellowship worth NZ$30,000 will be offered in 2015 (for travel in 2016), to a person who is currently employed in a public sector* organisation in New Zealand. Applications for the 2015 Fellowship have now closed. The next round of applications will be advertised in April 2016. · Build a leadership network on both sides of the Pacific, encourage ongoing exchange between New Zealand and the United States and establish enduring relationships offering reciprocal benefits to both countries. Successful candidates will be based at a US host organisation. The Fellow should utilise their US contacts and the assistance of their host organisation to source appropriate US and New Zealand connections. · have an interest in learning from your experience in the US and be capable of putting to effect in NZ, relevant lessons learned. · A fellowship valued at up to NZ$30,000 is offered in 2015 (for an award start date in 2016). New Zealand Harkness Fellowships are intended to contribute towards travel costs (international and domestic), accommodation and per diem expenses. The funds are not intended for the purchase of equipment or any other research costs. Additional costs in excess of NZ$30,000 must be met by the Fellow and/or their New Zealand employer. · A basic health benefit plan covering a maximum of US$50,000 per sickness or injury. · You must provide Harkness (via Fulbright New Zealand) with copies of any articles or research papers resulting from your Fellowship. A final report must also be completed before you depart from the US. · You must arrange for up to three references to be submitted by the application deadline, in the format outlined in the application form.